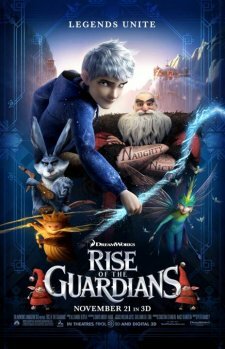 “Rise of the Guardians” is simply magical. It takes a very different view of the legends that we have all grown up with, bringing back nostalgia for adults and magic for kids. It attempts to truly make you believe in the childhood fables with its hair-raising battles, lovable characters, and spectacular wonders of lands beyond us. The myths of the holidays come together with the four immortal Guardians—the jolly yet tough Santa Claus, the warrior-like Easter Bunny, the entrancing Tooth Fairy, and the silent but adorable Sandman. It is their job to protect and bring joy to children all around the world. When evil Pitch (the Boogeyman) threatens to overtake the world with fear, teenager legend Jack Frost is appointed as a new Guardian. The Guardians must learn to work together as a team and get children to believe in them before it is too late. Jack embarks on his own personal journey, as well, finding his purpose in being a Guardian. It’s the “Rise of the Avengers” from our childhoods, and in a good way, too. “Rise of the Guardians” is visually stunning, especially in 3D. The sight of legends at work will make everyone believers once more. There are a lot of laughs and more heart than I expected. The poignant moments are expressive, especially when Jack bonds with the only boy, Jamie, who still believes in the Guardians. This is a movie for the entire family to enjoy without any innuendos, because the mere idea of legends uniting and epic battles in the night sky will make your jaw drop, cracking even the hardest of critics with its playful nostalgia. It also puts a fun twist on the characters, as well, bringing each one to life with a very distinct personality. The film portrays Jack as a fun-loving, mischievous teenage rascal who first rejects his new title as a Guardian, frustrated by centuries of disbelief in him. For three hundred years, he feels unwanted because no children believe in him—and therefore can’t see him. He declines the responsibility that comes with being a Guardian because he doesn’t understand why he’s chosen. When he asks, “Why me?” Santa tells him, “You have something very special inside, and we can’t do it without you.” Jack discovers that he has the makings of a true hero—selfless, courageous, and, surprisingly, kindness. There is mild name-calling between the Guardians, such as words like “bloody” and “coward”. Families can also talk about the worldly portrayal of Christian holidays. Christmas is supposed to be when we celebrate the birth of Christ, whileEaster is when we celebrate Jesus’ resurrection, but the secular view turns it into a mishmash of Santa, Christmas trees, the Easter Bunny and Easter eggs. Also, the Guardians look up to the mythical deity-like “Man on the Moon” for direction and guidance, instead of God. Another warning to parents is that younger children may be frightened by the idea that Pitch spreads fear through dreams and some battle scenes may be too intense for them. I would recommend this movie to any family looking for a whimsical, slightly quirky, magical movie. The voice-overs are commendable and the movie’s feel-good, keep believin’ tenors will draw the entire family into a world of hope, joy, and child-like innocence. All in all, this movie was a joy to watch. The uplifting morals will find their way to not only your heart, but to your dreams as well. I was accepted as a movie critic for Christian Spotlight on the Movies. Check out my movie review for Arthur Christmas and head to the movie theaters to begin your sleigh ride! Merry Christmas, everybody!!!! In the North Pole, there is a mass operation underground composed of mostly elves. Every Christmas Eve, the elves are hard at work delivering presents without being seen, using high-tech gadgets and gizmos to stay undercover. The current Santa (Jim Broadbent) helps out a little, but it is his older son Steve (Hugh Laurie) who overlooks the entire operation. Grandsanta (Bill Nighy) doesn’t do much of anything. It is the unlikely hero Arthur (James McAvoy), the youngest, bumbly, good-natured son, who actually embodies the spirit of Christmas. He works in the department which answers children’s letters addressed to Santa and finds a way to help in spite of his clumsiness. When an elf named Bryony (Ashley Jenson) discovers an undelivered present, she finds herself on an unexpected mission against time, along with Arthur and Grandsanta. He nearly gives up midway through the journey, but then realizes that it doesn’t matter how the present is delivered, just as long as it gets there. Their adventures lead the grandfather, father, and the older son to learn to love, embrace, and appreciate the Christmas spirit. Language: This is a clean movie. The phrase “what the…” is left unfinished. Steve says, “Idiot Arthur,” but other than that, there are no concerns, that I noticed. I was expecting potty humor, but surprisingly, either most of them passed over my head or there simply weren’t any. Violence: A few wild animals are encountered, although I think younger viewers won’t find this scary at all. A gun is fired, and missiles target Grandsanta’s sleigh, which explodes into flames. Sexual Content: None at all. Of course, the true meaning of Christmas can be discussed with your family—that Christmas trees, Santa Claus, and jingle bells are only incidental things. The meaning of Christmas is giving, for God has given us his very best present, the birth of Jesus Christ—our hope of eternal salvation. The 3D in this movie is fantastic and the animation beautiful. Seeing the elves go into action is exhilarating, and I felt like I was flying in the sky along with Arthur in his magical sleigh. I could make out every single detail of Grandsanta’s beard, and the snow was so tangible and real. I loved the spark of Christmas spirit that was brought to life by the wonderful voiceovers. The moviemakers were creative, challenging the subject of Santa sliding down chimneys with a whole new and fresh perspective. I like the idea that the elves are the ones who silently sneak into our houses, fill up our stockings, and make sure everything is perfect in time for Christmas. With the marvelous soundtrack, it was sincerely epic. I recommend this fun film for any family. It’s not just your average Christmas movie; it has its own funny and sentimental, but not gushy, moments, as well. Most adults will also enjoy it. As for the Justin Bieber fans out there, you’ll get to hear one of his latest Christmas songs, “Santa Claus is Coming to Town,” bringing down the curtains in the end. 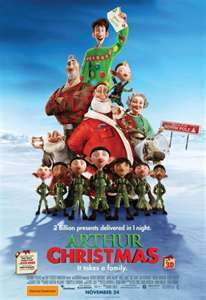 Arthur Christmas is exciting, exhilarating, and extremely funny for kids. Have you ever wondered how Santa flies around the world in such a short time? Well, in this movie, Santa doesn’t use a sleigh to fly around the universe with reindeer as you think; instead they have highly advanced technology to travel all around the world in one night. Arthur is the mail agent, who receives mail from kids and replies each letter back to them. He is the hero in this story, who tries all his might to deliver a missed present before sun rise. With the help off Bryony, a lowly elf from the Gift-wrap Battalion, Steve (Arthur’s big brother), and Santa, they work together to deliver the present. The best scene that I like is how thousands of elves shimmy down ropes from their ship and deliver the presents to billions of children in the nick of time. The animation is great, and I suggest you watch it in 3D. It shows fantastic images and the visual arts are mind-blowing. 3D movies have special effects that bring realism to the animation and scenery. When Arthur, Santa’s dad, and Bryony fly on the sleigh in 3D, I feel like I am in a Disneyland rollercoaster swooping upwards and downwards. There are some parts that scared me such as the gun shots, missiles fired at the sleigh and a few scary animals that attacked the sleigh. Also, 3 bad words are said in the movie including “idiot”, “what-the”, and “hell”. This is a fabulous movie for family and friends to watch together on Christmas. I think children over 5 years old can watch this marvelous Christmas movie. I rate this movie 5 stars and a Pick It!